A matte black finish beautifully contrasts the reflection from this contemporary geometric wall mirror. 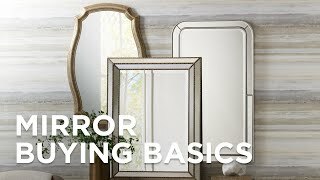 Matte black is used in home furnishings to attract light and this works perfectly on a mirror because the surface will reflect the light and brighten up any space. This geometric wall mirror has a decagon shape to standout from the ordinary. This mirror can be hung vertically only. 30" wide x 30" high x 3" deep. Hang weight is 13.6 lbs. Glass only section is 23 1/2" wide x 23 1/2" high. Surrounding frame is 3 1/4" wide. Geometric wall mirror from Noble Park. Matte black finish. Metal frame. Non-beveled glass.